At Arrk Group we place a great deal of emphasis on team-driven research and development, through our SpArrk Community programme. The Internet of Things, or IoT, is one such area where we engage with our communities to develop new concepts and ideas. What does Internet of Things mean? Simply put the Internet of Things, known as IoT, refers to the interconnection of devices, where the Thing can refer to a wide variety of devices with the ability to communicate via the internet. This might be the example often cited of a domestic refrigerator communicating when it is out of milk to the owner’s smartphone or the new to market home energy management devices which learn to create a personal heating schedule. In fact, the IoT market is expected to grow exponentially over the coming years, with Gartner predicting that as many as 26bn devices will be installed globally by 2020, in a market exceeding $300bn. One IoT installation can be found at the Arrk Group office in India, where we now have the ability to display the current and upcoming conference room bookings from the current Meeting Room Booking System (MRBS) on the door of a conference room, in real-time. Known internally as Project Chocolate, the real time meeting room display uses two radio transmitters, using the standard IEEE 802.15.4 protocol, also popularly known as ZigBee. These radio transmitters send and receive data wirelessly about the current bookings, from the existing Meeting Room Booking System. ZigBee was chosen over other popular technologies such as Bluetooth and Wi-Fi as it uses less power and is therefore a cheaper alternative. Using an Xbee Series 2 model, and operating on the 2.4 GHz radio frequency, the firmware running on the device was written using C language, with the PC software written in C#. Arduino, an open source electronics platform, was selected for prototyping the display device thanks to its rich set of libraries which makes it easy to communicate with the ZigBee devices. On a periodic basis, the meeting room booking system database is accessed and the information is sent wirelessly to the display on the conference room door using a USB XBee Explorer. At the other end we have an XBee device attached to an Arduino module. This module reads the received information and displays it on the LCD module. Despite the relatively straightforward application, the first challenge faced was configuring the XBee devices and making them talk to each other. XBee radios can be configured in a variety of ways, with each model also requiring a different way of configuring; the team also faced getting to grips with the 115-page long technical manual. 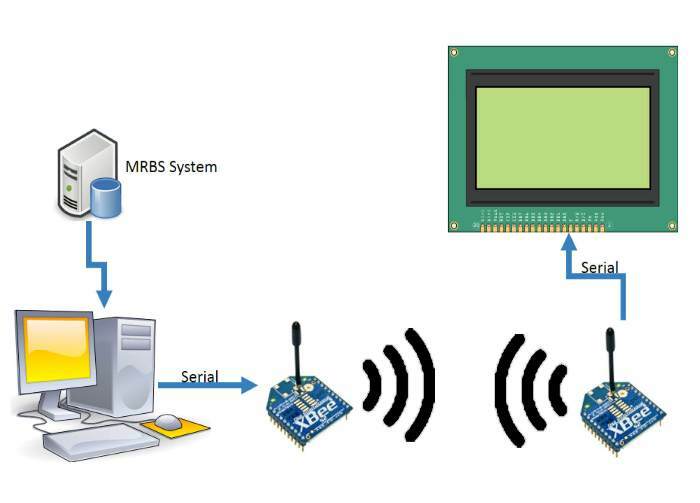 Eventually, both radios were correctly configured to talk to each other, and this lead onto the next challenge – successfully sending the data between the devices. Following an unsuccessful attempt at using serial communication, the process of sending data one bit at a time, the team switched to the 2.4GHz frequency. However, our Indian Wi-Fi network also operates on the same frequency which meant data was not reaching the other end properly due to noise. Finally the team switched to XBee API mode and with help from ‘Building Wireless Sensor Networks’ a stable, wireless connection was created. The Arduino prototype board was used to test the device in action, however we now needed to create a project closure which could be installed on the meeting room door. This required a Printed Circuit Board or PCB. Evaluating several open source solutions the team selected the Eagle CAD to create the PCB. The first version utilised a 16 x 4 LCD display screen, however we soon realised that this was too small and so upgraded to a Graphic LCD. This meant a change to the schematic and a revision of the PCB. At this stage we also upgraded the solution by incorporating a power saving button which would turn off the backlight after a predetermined amount of time. 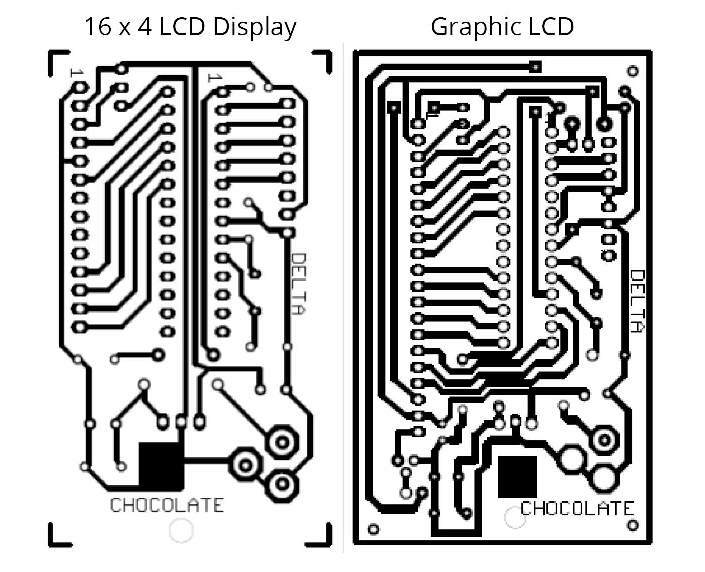 What is immediately apparent when comparing both PCBs is that this new version is significantly more complex than the first iteration, the reason for is that the Graphic LCD requires far more complex connections to make it work. The result, however, is a much clearer display which can display multiple bookings. 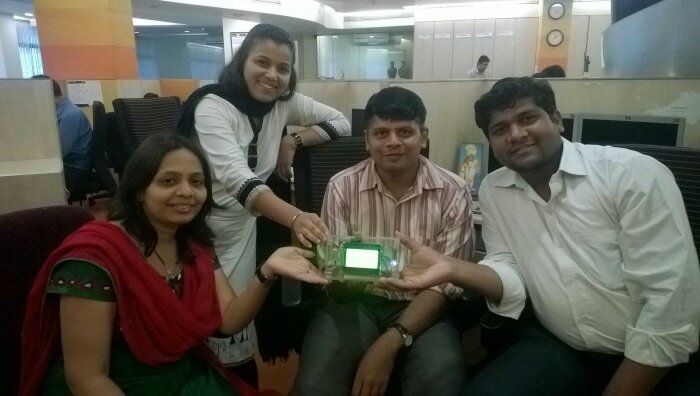 The successful conclusion of Project Chocolate is the Arrk Group India office now has a working prototype of IoT technology in use.